Make your own anthropomorphic figure with a functional or contemplative dimension. 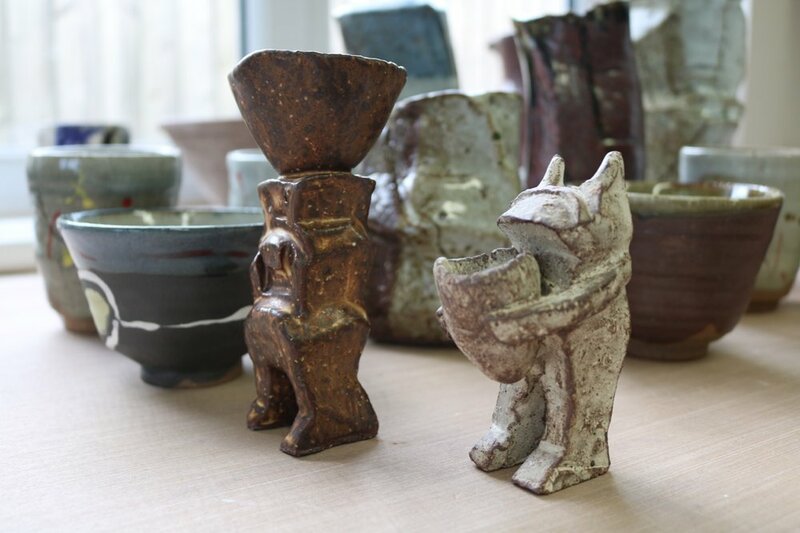 All welcome: anyone with, or without ceramic skills will find this course enjoyable and accessible. Beginners and experienced makers alike are welcomed. Though technical skills are helpful, beginners can make expressive and cogent work. This masterclass forms part of Clementina's residency at Leach Pottery. You will learn about historical concepts in various world cultures such as African tribal, Pre-Columbian, Japanese Haniwa, and some modern and contemporary art works. You will then make and decorate an anthropomorphic figure - it may have a functional dimension such as a candlestick, salt pot or lidded jar. Handwork is a very different experience from throwing pots: it is about imaginative structure. Clementina will teach reductive methods like cutting and carving, and additive methods like pinching and coiling . Work will be glazed and fired at a later date. Collection of the pieces will be possible about 4-6 weeks after the workshop or they can be posted (p&p extra). Underglaze colours for surface decoration and detail. Any tools you may have, a towel, pencil and paper, and short fingernails!